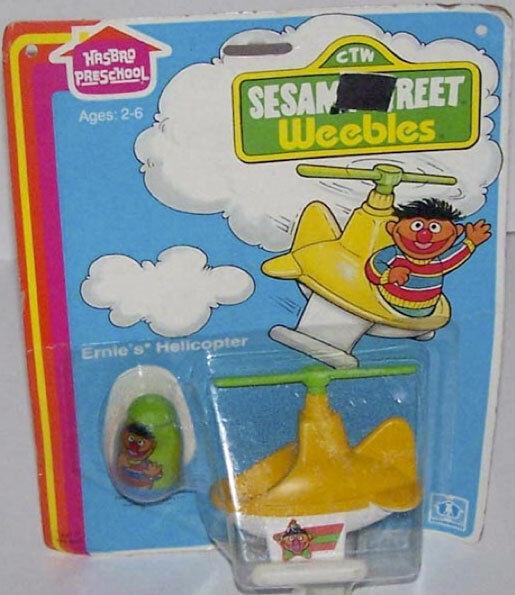 Description: Ernie loves to fly in his very own helicopter. HTW390 - Helicopter - Small 1-seat helicopter with a yellow top, white bottom, a green 2-blade spinable propeller on the top, and white pontoon landing gear on the bottom. Each side of the land gear has a litho of Ernie's face. Bottom of plane is marked, "©1973 Hasbro®, MADE IN USA".